This EurekAlert! 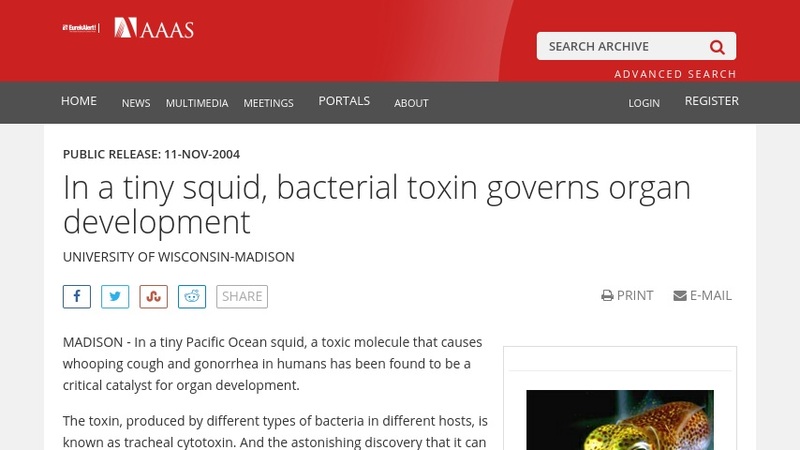 kids news article features information about the toxic molecule, tracheal cytotoxin, which is responsible for forming a light producing organ in the Bobtail squid-bacteria symbiosis. This toxin has been discovered to have both good and bad effects depending on the type of bacteria and host involved in the symbiosis: on one hand, it could cause disease and massive tissue damage, while on the other, it is vitally important in organ development. These recently discovered effects may force biologists to re-think the relationship between the world's many microorganisms and their host plants/animals.